Even samurai would have been vulnerable had they been glued to smartphone screens while walking. 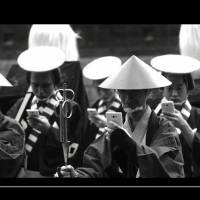 So says a video parody unveiled Tuesday by mobile carrier NTT Docomo Inc. that depicts a legion of samurai warriors undertaking a ritual pilgrimage while fiddling with their smartphones. The troops bump into each other, trip and fall — just as smartphone addicts do on the streets of Japanese cities. In those days, it could have been more serious: Some of the samurai are ambushed and killed while distracted by their gadgets. 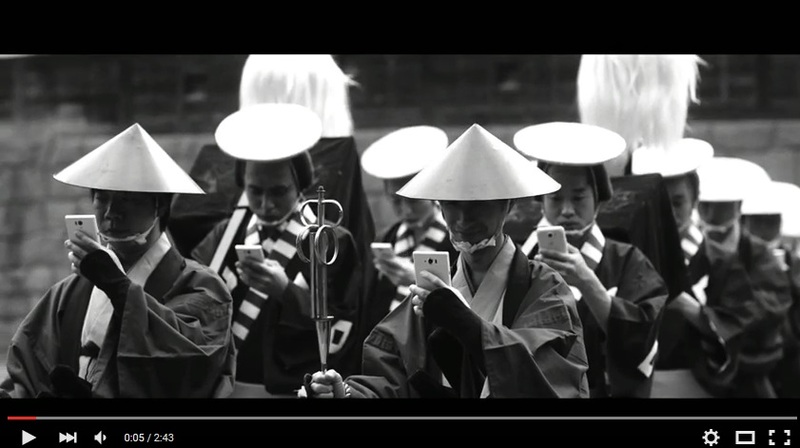 “To visualize the danger of using smartphones while walking, we thought a samurai parade is a perfect motif to go with, because it’s something Japanese people can easily picture,” Docomo spokesman Akehiro Tomita said. The video, titled “Aruki Sumaho Sankin Kotai” (“Samurai Smartphone Parade”), represents the mobile carrier’s latest attempt to warn users of the danger of aruki sumaho, or using a smartphone while walking. It is set against the backdrop of sankin kotai, an Edo Period samurai ritual in which daimyo and their subordinate samurai periodically marched between the Edo capital and their fiefs, under the rule of Tokugawa shogunate. The video’s release this month has an added resonance: figures from the Tokyo police show that December is the deadliest time of year in terms of traffic accidents. In March 2014, Docomo released a video showing what kind of a mess would ensue if 1,500 pedestrians tried to cross scramble crossing outside Shibuya Station in Tokyo while glued to their smartphones. A survey of 648 adult smartphone users carried out by Mobile Marketing Data Labo in 2014 found that 66.3 percent have collided with passers-by while using smartphones, 18.1 percent tripped and 3.6 percent were so distracted they fell from a railway platform. The same survey also found that while 98.6 percent think using smartphones while walking is dangerous, 73.1 percent have done it. The video can be viewed at http://jtim.es/ViZSy .